Focusing on the work of Lorenzo Valla, the Spanish Complutensian scholars, and Erasmus of Rotterdam, this book examines the New Testament studies of the Renaissance humanists rather than their more frequently studied religious, moral, and political thought. 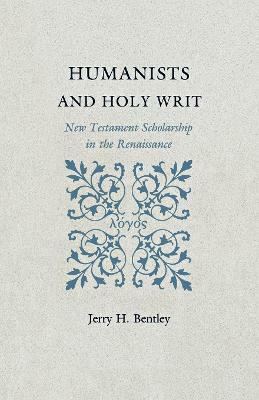 Jerry H. Bentley shows that the humanists brought about a thorough reorientation in the Western tradition of New Testament studies. He finds that the humanists' methods both anticipated and influenced later New Testament scholarship. The humanists rejected the medieval practice of studying the New Testament only in Latin translation and interpreting it in accordance with preconceived theological criteria. Instead, they insisted that New Testament studies be based on the original Greek text, and they employed linguistic, historical, and philological criteria in explaining the scriptures. This study rests on an analysis of the New Testament manuscripts that the humanists consulted and of the New Testament editions, translations, annotations, an commentaries that they prepared.